Commemorate the Battle of Hoth! Paper giclee inspired by Star Wars: Episode V - The Empire Strikes Back. A limited edition of 125 pieces and signed by the artist! Celebrate the hit Star Wars series with this awesome piece of artwork! 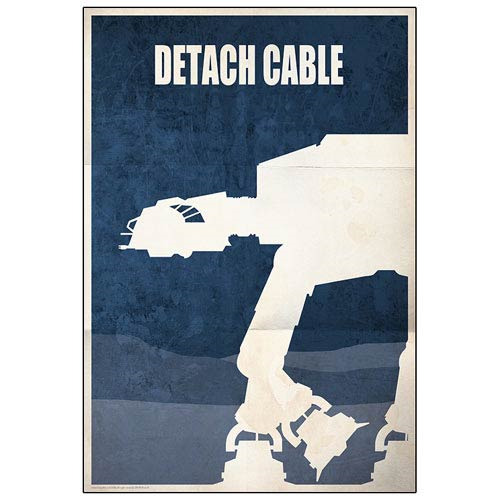 The Star Wars Detach Cable AT-AT Walker Hoth Battle Paper Giclee Print commemorates the iconic Battle of Hoth scene from Star Wars: Episode V - The Empire Strikes Back when Luke Skywalker is piloting his Snowspeeder and attempting to trip up the deadly AT-AT Walkers of the Galactic Empire and features the words, "Detach cable." A minimalist design, this great giclee features just the words and an AT-AT Walker and is a limited edition of 125 pieces hand-numbered and signed by artist Jason Christman. Measuring 18 1/2-inches tall x 12 1/2-inches wide, this great giclee includes a certificate of authenticity and is a must-have for Star Wars fans!